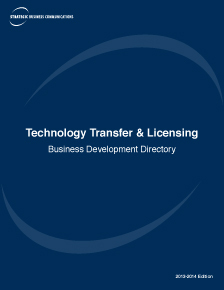 A controlled circulation business development directory profiling all major organizations involved with technology transfer and licensing. Comprehensive worldwide coverage of the market including major corporates, patent licensing organizations and university and national laboratory technology transfer offices, as well as service providers and other relevant organizations. Distribution: 14,000 qualified executives involved with technology transfer and licensing.